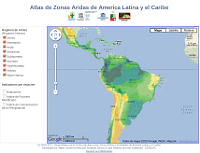 It may be pointed out that there is a wide range of information on arid, semi-arid and sub-humid zones in the LAC Region. However, data are incomplete or come from different sources, which makes it difficult to precisely know the real extension of these territories. Likewise, the region has some indicators regarding global water availability, both at a regional and national level, but these do not provide a reliable view of the existing demands and effective water supply from the climatic point of view, especially at each country level. This is even more important in countries where some territories show several aridity degrees and other zones have an excess of water resources; therefore, when general indicators are estimated, these significant differences are not recorded. On the other hand, it is widely known that desertification processes are present in the majority of the territories showing water shortage (and the importance of developing actions to mitigate the relevant effects,) as well as the recurrent droughts affecting these areas, which contribute to worsen these negative processes, thus hampering population’s development and the preservation of the ecosystems associated to these environments. The main problem to delimitate and define the characteristics of arid, semi-arid and sub-humid zones, from the climatic point of view, is assessing and identifying the climatic variables required to create a water deficiency and excess that will account for the relation between the water resources incoming to a system and out coming from it. Having more information regarding this point will make it possible to better analyze each particular situation and take the appropriate steps for each case, both regarding investments and development projects and improving development and legal regulations, among other aspects.